Taoist Qigong is a spiritual discipline that cultivates body and mind simultaneously. Through the lineage handed down by Dr. Eva Wong, traditional outer and inner Qigong will be presented from two systems: the Pre-celestial Limitless Gate School (Xiantianwujimen) and the Yiquan School, neither of which have previously been fully transmitted to students in the West. Eva Wong is a 19th generation lineage carrier of the Primordial Limitless Gate School of Taoism. The student of Sun Di, she is also a 3rd generation lineage descendant in Wang Xiangzhai’s Yiquan school of martial arts and Zhangshuan - standing qigong. She is an independent scholar who has written and translated many books on Daoism and related topics, including Nourishing The Essence of Life: The Outer, Inner, and Secret Teachings of Taoism and A Master Course in Feng Shui (published by Shambhala Publications). 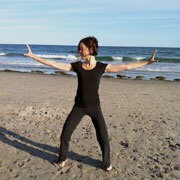 On behalf of her lineage, she offers a comprehensive program involving nine levels of qigong. In Level One (Saturday), students will be instructed in various techniques of outer and inner qiqong. There are no prerequisites for Level One. In Level Two (Sunday), students will learn the Nine Self-Massage Techniques and the Twelve Devas Tendon-Changing system in their entirety. The Taoist view for these teachings will be based on Eva Wong's, Nourishing the Essence of Life. Level One is a prerequisite for Level Two. Physically, qigong massages, stretches, and strengthens the body. Energetically, it nourishes the internal organs, gathering and conserving energy. Ultimately, qigong dissolves the duality of mind and body to allow us to live a fully engaged and creative life. Note: Women who are pregnant should wait until after child birth to participate. Qigong is not recommended for children 14 years of age and younger. Students need to have taken Level One in order to take Level Two. Completion of these two levels attended together on the same weekend will qualify students to register for Level III.